CORVALLIS, Ore. (AP) Washington quarterback Jake Browning’s performances against Oregon State are part of what will make his already standout career memorable. Browning threw for three touchdowns, Myles Gaskin ran for 113 yards and a score and the No. 6 Huskies broke open a close game with a 21-point third quarter to beat Oregon State 42-7 on Saturday night. Browning completed 26 of 34 passes for 293 yards and had touchdown throws of 5, 15 and 34 yards to Dante Pettis , who had 12 catches for 105 yards. Browning has accounted for 12 touchdowns, 10 passing, in three career games against Oregon State. ”I think we were a couple plays in the first half from really opening it up. And that kind of happened in the second half,” Browning said. Gaskin ran for a third-quarter touchdown and had 15 carries in posting his second consecutive 100-plus-yard game for Washington (5-0, 2-0 Pac-12). The Huskies finished with 509 yards after struggling initially to get going. Washington’s defense was smothering, holding Oregon State (1-4, 0-2) to 184 yards and eight first downs. The Beavers didn’t cross Washington’s 45 until the final six minutes. ”To have a day like that, I felt everybody was playing really solid and doing their job. That’s exactly what you want,” Washington linebacker Tevis Bartlett said. Oregon State quarterback Darrel Garretson, making his first start of the season in place of injured Jake Luton, completed 11 of 22 passes for 74 yards. ”We were dysfunctional. That’s a really good defense. 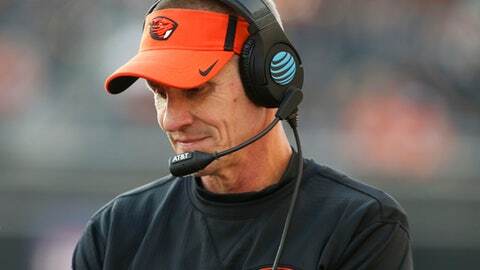 But you have to be able to get some first downs,” Oregon State coach Gary Andersen said. Washington carved up Oregon State on its first drive, marching 98 yards in 10 plays. Browning scored on an 11-yard run to give the Huskies a 7-0 lead. But Oregon State’s defense, statistically one of the worst in the FBS in nearly every category, rebounded with a strong performance the rest of the half. Washington threatened only once on its final four drives of the half and came up empty when Tristan Vizcaino bounced a 42-yard field goal attempt off the left upright. But the Huskies scored 35 points after halftime. The Huskies nearly had their first shutout against a Pac-12 opponent in eight years but Oregon State’s Thomas Tyner scored on a 12-yard run with 3:23 remaining. Washington: The Huskies have had a difficult time getting going on the road this season, scoring only 27 first-half points in three games, but Washington is still off to a 5-0 start. Oregon State: The Beavers had a strong defensive showing in the first half, including three sacks, but were outmatched after halftime. Washington, leading 7-0, opened the third quarter with a drive that appeared stalled at fourth-and-10 at the OSU 25. The Huskies passed on a field goal attempt, instead going with an outside run play to Lavon Coleman, who burst 20 yards to convert the first down. The initial play was called as a pass, but Petersen said Browning checked to a run. ”Jake has a lot on his plate, and he doesn’t miss much. . That was probably his best play of the game doing that,” Petersen said. Pettis, whose eight career punt returns for touchdowns are tied for an NCAA record, rocketed up Washington’s list of career touchdown receptions Saturday. The senior moved from sixth to third after catching three against Oregon State, increasing his career total to 23. With the win, Washington figures to rise after No. 5 USC lost Friday night at Washington State. Washington: The Huskies return home to play California next Saturday. Oregon State: The Beavers travel south next Saturday to play at USC, which is coming off a 30-27 loss to Washington State.